Now entering its third year the powdery mildew citizen science scheme is gaining more momentum, more followers, and more samples. Can we hope for more again this year? The inaugural 2014 Powdery Mildew Survey produced a total of 160 powdery mildew samples resulting in 51 different species. This was followed in 2015 by a further 353 samples: 54 species. In 2015 we identified powdery mildew on new hosts, and concluded with the adoption of the scheme by GCSE course conveners; students will now have the opportunity to contribute to science and learn via this novel method. So, with two years of citizen science collection records, a baseline of species recorded in the UK, and spring arriving, what better time to launch 2016’s Powdery Milwho? So please send in your powdery mildew infected plant material for identification: will yours be a common UK species, a species shifting to a new host, an invasive species, or even a new species? Follow the guidelines on how to send in your samples here. English oak (Quercus robur) infected with commonly found powdery mildew species Erysiphe alphitoides in the experimental trial plots at the University of Reading. Powdery mildews commonly occur on garden plants, are unsightly, and can cause serious damage. 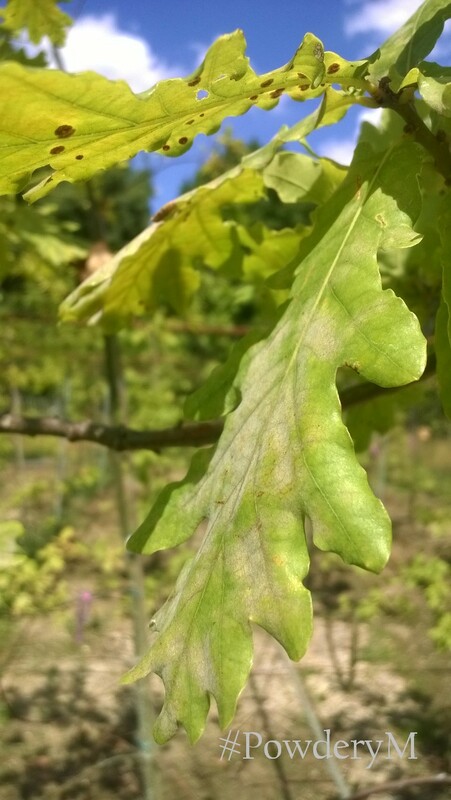 To help understand how widespread powdery mildews are, both in terms of geography and hosts, the Royal Horticultural Society and University of Reading are working together to identify and map as many powdery mildews as possible. You can help by supplying us with infected plant samples and in exchange we will do our best to tell you what mildew is infecting your plant. With over 900 named species, occurring on more than 10,000 different plant hosts, even experts struggle to ID them effectively. I am able to collect and analyse many powdery mildew samples around the University campus and further afield in Reading. However, it is necessary to gain more samples, from more UK locations, on more host plants, in order to better understand the problem in UK gardens. Using DNA sequences I will be able to identify and map their occurrences to discover where and when they are most prevalent. This will ultimately allow the development of short DNA sequences allowing for easy ID of similar samples in future. Quick, accurate and efficient identification of these garden, fungal foes will help to track the presence of British based species on their host plants, perhaps discovering new species invasive to this island. It will also allow us to track which have recently expanded their host ranges to infect new plant species. UK gardeners and plant enthusiasts can help to build the global knowledge of Fungi and plant diseases. To help this important research please collect and send your infected plant material to me! This entry was posted in PhD research, Public Engagement with Science, RHS research and tagged #PowderyM, 2016, Citizen Science, Erysiphaceae, Erysiphales, Fungal identification, Fungi, Oli Ellingham, Oliver Ellingham, Pathology, Powdery Mildew, RHS, Royal Horticultural Society, Survey. Bookmark the permalink.